The "Giving Tuesday" Seal of Approval. It is not too late to make a contribution to support Save the Harbor/Save the Bay in 2013. You can make a contribution online right now - just click on the link or visit our website at www.savetheharbor.org. Or, if you prefer, you can read a short letter (see below) and learn more about all we accomplished in 2013 and what we intend to do in 2014 - and then make a contribution to support our work! Here's wishing you and yours a great Giving Tuesday! As the year draws to a close, you will not be surprised to learn that 2013 was a busy and productive year for Save the Harbor/Save the Bay. Click on an image to see a collection of press clips or collages from 2013. In 2013, we convened 10 public hearings in 9 communities with more than 700 participants for the Metropolitan Beaches Commission to help the Massachusetts Legislature move our beaches from good to great. Our Beaches Science Advisory Committee issued the region’s only comprehensive report card on water quality and flagging accuracy, focusing attention on beaches in Lynn, East Boston, Dorchester and Quincy that are still closed after small summer storms. Our free Youth Environmental Education Programs employed a summer staff of 32 that included 6 senior harbor educators, 7 college students, and 19 urban teens, connecting 15,903 youth and teens to Boston Harbor and the Boston Harbor Islands. Our Better Beaches Program awarded small grants to 14 groups in 9 beachfront communities and waterfront neighborhoods to support more than 30 free events including concerts, beach festivals and sand sculpting competitions from Nahant to Nantasket. We also hosted the 3rd Annual Youth Beach Bash and Splash, which brought more than 750 kids to the beach to celebrate clean water, and the Swim and Paddle for Boston Harbor, a one-mile, chip-timed competitive swim and paddle board race on one of the cleanest urban beaches in America. Despite our success, there is still more work to do and we need your help to do it. Your contribution of $50, $100, $500 or more will help us sustain our advocacy, accelerate our policy agenda and meet the increased demand for our free programs. Make a donation online today by clicking here. Convene a regional meeting of the more than 700 stakeholders who took part in this summer’s Metropolitan Beaches Commission hearings to review our findings and recommendations, and release the final report focused on economic development opportunities, management reforms, capital investments, and increased investment in staff, equipment, planning, and free programs. Focus attention on water quality and beach flagging accuracy, which prevent the pubic from enjoying the benefits of the $5 billion Boston Harbor cleanup on public beaches in Dorchester, East Boston, Quincy and Lynn. Our Beaches Science Advisory Committee will release our 3rd Annual Beaches Report Card and work with local, state and federal officials, opinion leaders and the public to address these issues. 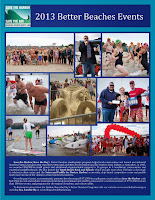 Strengthen Boston’s waterfront neighborhoods and the region’s beachfront communities by growing our cold-water pledge fundraiser to support 40 Better Beaches Program events and programs on public beaches from Nahant to Nantasket. Increase meaningful public access to Boston Harbor and the Boston Harbor Islands by expanding our free youth environmental education programs that have served nearly 90,000 youth and teens since we began them in 2002. As I am sure you know, Save the Harbor/Save the Bay is the region’s leading voice for clean water and public investment in Boston Harbor, the waterfront, the region’s public beaches and the Boston Harbor Islands. When we were founded in 1986 the thought that Boston’s polluted beaches, abandoned waterfront, and neglected islands would ever be seen as assets instead of liabilities was a radical one. The very idea that our region’s young people and their families would ever be able to use Boston Harbor, our region's public beaches and the Boston Harbor Islands as a learning laboratory and a healthy place to play was a distant dream. Today we are proud to say that Bostonians and the region’s residents are beginning to see Boston Harbor, the beaches and the islands as civic, educational and recreational resources that belong to them and their communities. I want to share a visceral moment with you. This summer I was on the beach in South Boston with about 750 kids at our annual Youth Beach Bash & Splash. As I watched kids of all colors, shapes and sizes swim, splash, and explore together on a beach that Save the Harbor/Save the Bay had transformed into one of the cleanest urban beaches in America, I was struck by the extraordinary legacy that we were leaving to the next generation. To me that beach was a blank canvas that we had transformed into something beautiful. Imagine what the world would be like if everyone had the same opportunity and access to something as beautiful as our harbor and wonderful as that beach. Creating new generations of opportunities is what Save the Harbor/Save the Bay is all about. I am proud to be a part of it and committed to carrying it forward for the next generation. I am certain that you are, too. I know you share our dreams for Boston Harbor. As the year draws to a close I hope I can count on your financial support. You can make a donation online today by clicking here. P.S. Happy Cyber Tuesday, and thanks for your support.